Manufacturer Jabra has launched the Elite 25e, an in-ear stereo neckband headphone with “best-in-class” battery for wireless calls and music. Jabra claims that one charge delivers all day or week power with up to 18 hours of battery life – what it claims is the best performance for a headset in this class. The neckband has bendable flex zones and users are encouraged to fit Jabra’s EarGels to get better in-ear sound. The headphones also offer a dedicated voice control button and message read out, with one-touch access to Siri® and Google Now™. With an RRP of £69.99. 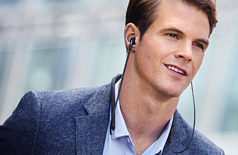 Jabra Elite 25e is now available across the UK, Europe and USA.